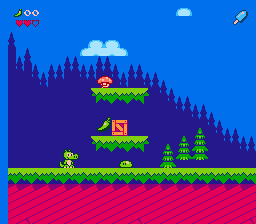 the NESdev Compo deadline is tomorrow and I just sent my entry today. 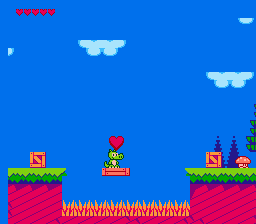 I attached the final ROM in this post (Twin-Dragons-20170131-0.074.nes). I really had a blast coding it and I hope you guys will enjoy this short game. 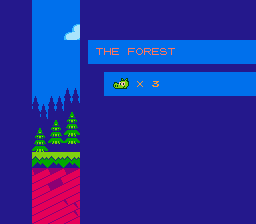 Please give me your feedback as I'm planning to expand the game with more levels / features and release a cartridge for it later. Other: The game is fully PAL/NTSC/DENDY compatible. 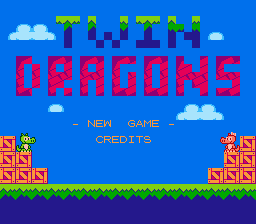 Finally writing a post to introduce my entry to the compo : Twin Dragons. Using some of Surt's graphics and MadMarcel extra graphics, I'm making an horizontal side-scrolling platformer. I've been working on it for two weeks now, re-using some code from other projects or test roms. The test level is very simple and mainly used to check every feature. 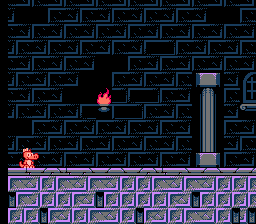 By the way I'm looking for some advice or articles on level design, if someone can help me on this it would be greatly appreciated ! Here are some screenshots, I'll try to add a video this week. That's it for now, I'll keep you posted ! Clouds have been flipped, and I introduce you Minky which will have to rescue Dinky. 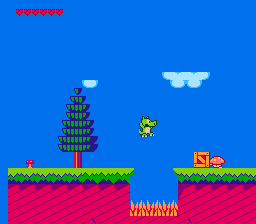 I attached a test ROM so you can test the game and maybe give me some feedbacks. The level is not a loop, but I copy/pasted the same portion multiple times. There's not ending and you can't die. Water is not implemented for now, so you're wrapping vertically. It should be PAL/NTSC compatible . Dinky can finally die, it brings you back to the title screen for now. Item collect and enemy death animations, and a lot of bugs fixed ! 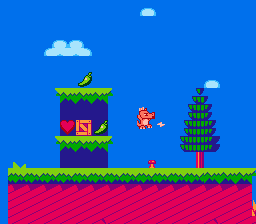 Next step : flying enemies ! Transition screens added ! The game flow is now completely working ! 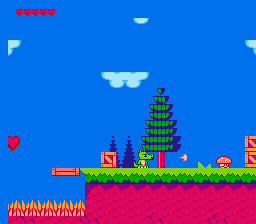 And here's the first power-up in action ! You can now freeze enemies by pressing UP+B after picking up an ice cream. Finally, the second power-up will help you to kill tougher enemies by pressing UP+B, after picking up a red pepper ! Hey folks ! 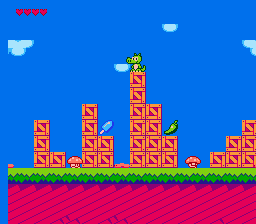 Will you be able to defeat Cactus Clay, the first boss of the game ? Last edited by Broke Studio on Wed Apr 12, 2017 11:21 pm, edited 19 times in total. It sounds and looks good. My only issue issue, is, the clouds look upside down. If you study cloud science, there's something called a 'ceiling', below it, the temperature and pressure aren't right for cloud formation. So, the bottom of clouds tend to have a flat appearance. This game looks charming as hell! Lovely use of colour, lovely artwork! On ideas, i think the boxes are better looking if they are sparce. Could there be another graphic element in addition to them for over-ground solid blockades? Could the boxes be interactable? Twin... double... The dragons aren't named Billy and Jimmy, are they? Or Alex, like the Allegro library mascot? Would interactive boxes look anything like this tech demo that I made a few years ago? Since the graphics have not been made by myself and are free, I can't complain on things like this. But I can definietly try to do something about it ! Thanks too ! I'll check my inbox. Kudos to Surt for the graphics. 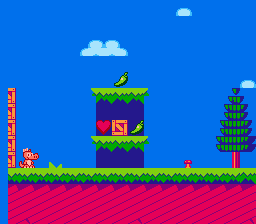 This is a test level, real ones won't be so crowded with boxes. They won't be interactable though, I have another graphic element for this (or maybe I'll switch the two). According to the graphics' author, they're named Dinky (green one - the boy) and Minky (pinkish one - the girl). And no the boxes won't be interative like your (impressive) demo. Why not be progressive and have the girl rescue the guy? That's actually a good idea, I'll do this. First post updated by the way ! I just realized, those 'cracks' or panel overlaps (i don't know what to call them) at the bottom of the purple/magenta ground might not be visible to everybody due to overscan. You may want to move and/or copypaste some of them one or two 8px cells upwards so you're guaranteed to show those nice details. This is still my test level. 'Cracks' will be more randomly placed but visible, avoiding overscan 'zones'. The screenshots are in NTSC though, so there's already overscans on it. Nestopia refuses to open the file claming it uses an unsupported or malformed mapper. Tried in Fceux and it plays great. Really beautiful and very promising, really fun and easy to control. I quite like it. It took a while until I got used to the jumping (a tad fast, vertically), but the learning curve is not steep. It's fine, got it after a short while. It seems that you are using horizontal mirroring. Wouldn't vertical mirroring be more suited for a horizontal scrolling game, or are you planning 8 way scrolling or vertical stages? 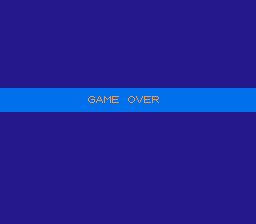 I could only get it to work with 1 emulator, FCEUX, (out of 4 that I tested)...I guess because it is mapper 28. 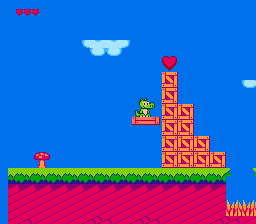 It's kind of hard to jump onto a small platform (box)...or rather, too easy to jump completely over it. The music crashed after a minute or two. Otherwise, looks good. Hope you finish it soon. Nestopia refuses to open the file claming it uses an unsupported or malformed mapper. It's using mapper 28, which is relatively new. Though nes2edit.exe complains it has inconsistent/malformed data in the header? (Not sure why, though, the header looks OK?) Maybe it's the use of byte 9 to suggest PAL, which most emulators ignore? I find the game feels a lot better in PAL mode, and a bit too fast in NTSC.